I have been working on a search to find two separate properties for an English client who completes on both of them this month. I know she won’t mind me mentioning her because I think she is a real inspiration to us all. Instead of taking early retirement in the UK and putting her feet up, she has decided to move lock stock and barrel to France to really make the most of her new found time and enjoy the ‘good life.’ This is brave enough on your own and at this stage of life but even all of this was not enough of a challenge for her. 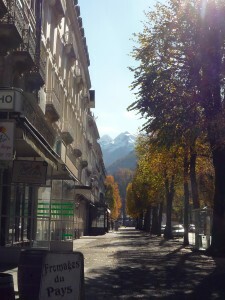 So she also asked me to find her a lovely rental apartment in the nearby ski and spa town of Bagnères de Luchon. This is going to provide her with a ‘job’, a steady income and also with a way of ensuring that she gets out and meets people and makes the very most of this beautiful region. I think what she is doing is just fantastic and I hope I hope in ten years time that I have as much energy and zest to strike out in new directions, take on new challenges and head off on new adventures. Such a dream would have been very difficult to achieve in the UK but here it is more than possible. I take my hat off to her and, being the person she is, I know she will make a huge success of her new life here and never regret for an instant leaving the metaphorical pipe and slippers back in England. Bonne chance.